A restricted padlock is one that uses a key that cannot be copied and is not in common circulation. 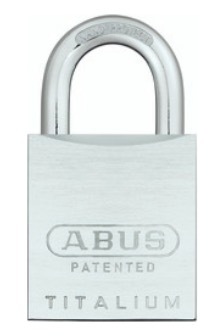 In this specific case the ABUS Eighty Three AL lock uses a special Bravus 1000 dimple key cylinder. With patent protection until 2030 and unlimited trademark protection, it also has an intellitec system which protects against unauthorised key copying. It is important to note that no lock or keyway is 100% protected and in the same way, no padlock is 100% pick proof. Although there is currently no way to copy the Bravus 1000 cylinder, criminals and illegal lock-smiths are always developing new ways to overcome security. The only thing that manufacturers can do is to keep on top of research and constantly develop new and unique products. The ABUS Eighty Three range has evolved from their 83 series which led the way in high security padlocks. These Titalium range of padlocks use the same technology in terms of high security features such as ball bearing locking which prevents level and force torsion attached with crow bars. They also use special anti-pick barrels and hardened alloy steel shackles.